There has been a huge outcry against Baylor's football program after our story of the Baylor kicker refusing to leave the field during halftime of their game against Texas Tech Saturday went viral. The story made it's way all the way to the Head Coach of the Baylor's football program, Matt Rhule. 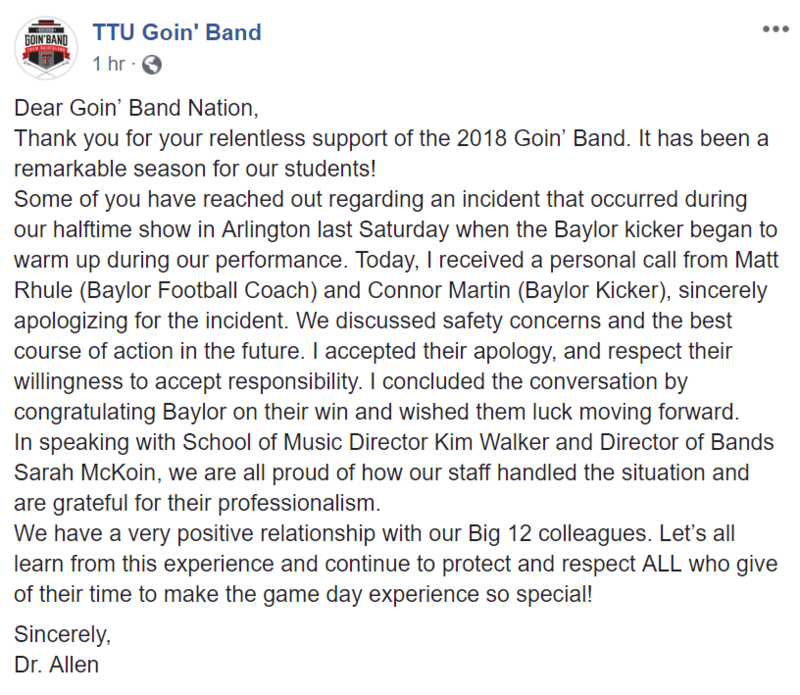 This afternoon Rhule and Baylor kicker Connor Martin, personally called Texas Tech Goin Band Director, Dr. Eric Allen, and apologized for the incident that happened on Saturday. The three discussed safety concerns and best practices moving forward. This was a great resolution to a situation that could have been harmful to both the player and band members. We have seen an uptick in these close calls each year. It is time that the NCAA and football coaches addressed this issue specifically. No band member or director wants to get in the way of the players warming up before they play, however, players have to be respectful of the fact that the band is given a certain amount of time to perform. That time specifically allows the band to perform and still allow the players to do what they need to do to get ready for the second half. 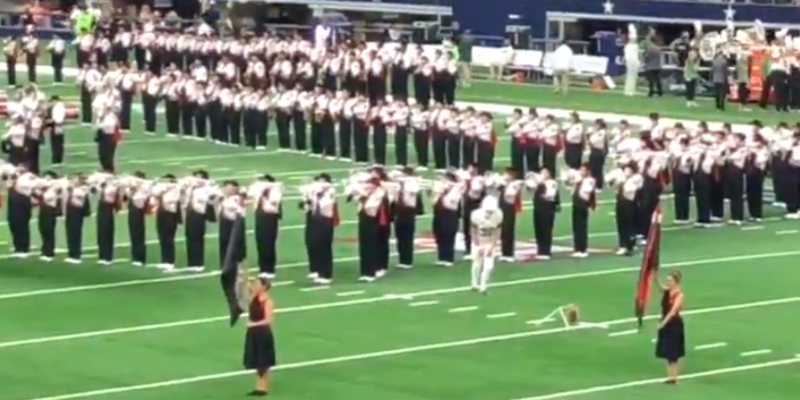 Seeing kickers across the country come out earlier and earlier and take the field to practice kicks in the middle of the band's halftime performance is incredibly dangerous to both them and the band members. The day is coming when someone will get seriously hurt. We appreciate Coach Rhule and Connor Martin understanding the situation and doing the right thing by apologizing. Coach Rhule has always been supportive of the bands of the institutions he has coached at and to see him take this action is no surprise. We're happy to see this resolved.